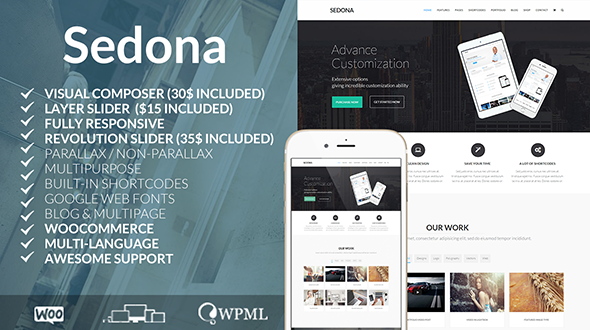 Sedona is a Multi/One Page WordPress Theme that is considered as a perfect solution for all kinds of businesses from corporations, shop owners and small businesses to startups, artists and bloggers. Sedona wordpress theme gives you the power to create a unique-looking website with an easy-to-use drag and drop page builder that’s fully responsive, retina-ready, and SEO-optimised. Lots of options and configurations will help you to customize almost any part of your website as easy and comfortably as you could ever imagine. And, with this theme you don’t have to start from a scratch – we got you cover with demo content included. So you just have to replace the demo content with yours..
WooCommerce compatible – build your own online shop!